- Five sealed brass burners with up to 47,200 BTU. - Centralized controls for ease of use and operation. - Sturdy stainless steel material with large, professional front-control knobs. - 1 large center brass burner with output of 18,000 BTU. - 2 high output brass burners with output of 10,000 BTU. - 2 standard brass burners with output of up to 5,500 BTU. - Control knobs with ring and output marking. - Gas valve with fine control. - Cast-iron grates with flat, continuous surface. - Sintered metal burners that are sealed to prevent spills from entering the burner box. - LP kit for conversion to LP gas included. 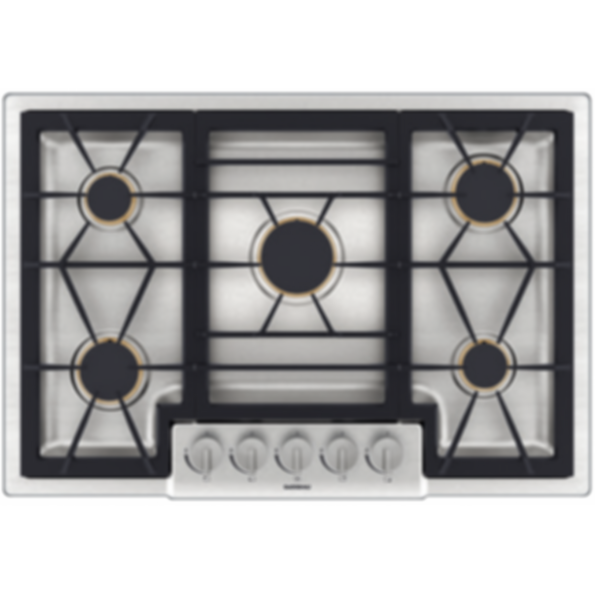 - Minimum distance between gas cooktop and ventilation must be at least 30". - Built-in ovens can be installed below the gas cooktop as long as there is no contact between the bottom of the cooktop and the top of the oven. - The appliance must be set up and connected in accordance with the applicable installation specifications. A ventilation hood must be switched on during operation of the gas cooktop. The rear panel must consist of a non-flammable material. Wall trims must be heat resistant. Minimum distance from rear wall to cooktop must be 3" and minimum distance from cooktop to counter front must be 1 7⁄8". - Total rating: 47,200 BTU. - Total Amps: 15 A. - Connecting cable 60" with ground plug.